This publication makes compelling reading for all those who have had any contact with East Africa or any interest in maritime matters and development of the colonies. The considerable amount of research and investigation that has been carried out to make this presentation possible has made it a combination of a technical and historical interest conjuring up memories of fact and no doubt in many cases possibly stimulating the imagination. The author's personal involvement in several incidents described are well documented. Some good colour prints of vessels would have enhanced the contents of the book, particularly when so many are available these days. It is difficult to say how many omissions have been made and the accuracy and detail of certain accounts are questionable with the exception of those with which the author was directly involved. Much is said about where the blame lies for the many strandings and losses but little consideration is given to the age and conditions of certain casualties. It is not possible or necessary to comment on every such case, but as examples I mention a few. In the case of the loss of the Bente Dania, the owner's superintendent was completely in charge of the rescue operations and the Kenya Navy was in no other way involved apart from flying the crew back to Mombasa. In 1993 the Canadian Spirit crashed into the quay in Mombasa at half speed and at right angles. Luckily the quay was not badly damaged but the vessel's bow certainly was. The Bonsella capsized alongside at Tanga due to instability caused by the ballast tanks not being completely full of water. No mention is made of the loss of the Acor, Angel or the Aventure and probably many others. The East Coast of Africa is really no different to many other areas in the world where the seas are governed by wind, tide and strong currents, which have been well described in numerous publications. 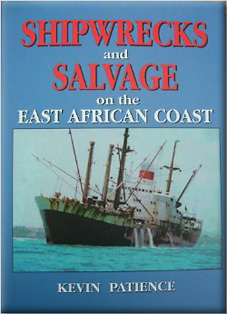 It is a pity this book is restricted to shipwrecks mainly in Kenya, Tanzania and Uganda, bearing in mind the total number of known casualties which have occurred between Cape Gardafui, Somalia down to The Cape of Good Hope, possibly close to 1,000 or more. Credit must be given to the mariners of the early years for their skill and ability to survive despite the lack of navigational aids and technical knowledge, particularly weather patterns. Originally the relevant important trading areas over the years were primarily with the Yemen, the Persian Gulf and India, Kenya and Tanganyika. Mombasa became a major passenger port for European settlers and Asian immigrants. Later, this was also to become of considerable importance for members of the Colonial Service developing and administering the colonies. These services were suspended during the two World Wars and thereafter continued until such time that regular commercial air travel was developed after World War two. Very few of the casualties described in this book have been caused by collisions which are invariably caused by human error. Thankfully I am not aware of the stranding of any of those carrying substantial numbers of passengers on the East African Coast with the exception of ferries. Stranding or groundings are invariably caused by weatherenhanced circumstances but increasingly are due to negligence and in many cases to inexperienced ship's crews and sub-standard vessels. In the case of overladen ferries such disasters have caused considerable loss of life. I note that most of the vessels described are 'vintage' vessels and many I have boarded in Mombasa and Dar es Salaam between 1982 and 2000 have been questionably seaworthy. As evidenced in the book, facilities and expertise have not been developed to handle any major disaster from whatever cause and that is one of the reasons why Mombasa and Dar es Salaam have become graveyards for so many ships just abandoned and left to rust away or to be sold for scrap. At the present time, with the exception of port areas, there is no practical way of handling heavy pollution should it occur. However, the book is well worth reading and gives a good insight into how the Interior was opened up for trade, particularly with the introduction of the railways and opening up of the Lakes.